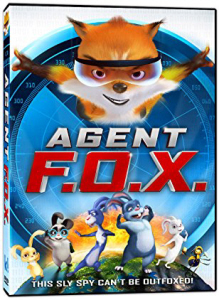 I suppose a bit of my own disappointment with this particular film stems from the very fact that Aardman’s domestic advertising campaign coupled to DreamWorks boasting that it came from the creators of Shrek left me expecting something much more grandiose then what actually exists here. What does exist here is an 85-minute tale of one Roddy St. James (Hugh Jackman), a decidedly high-class pet rat who makes his home in a polished brass cage within in a posh Kensington flat. 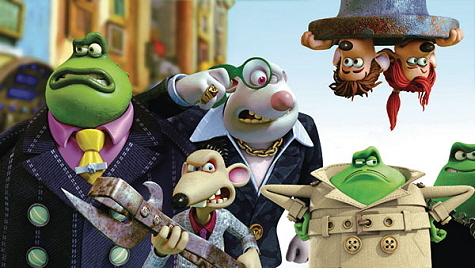 His high society existence comes to a screeching halt when a common sewer rat named Sid pops out of the kitchen sink and decides to stay, especially considering their home land of England happens to be playing arch nemesis Germany in the FIFA World Cup final and what posh Kensington flat isn’t complete without a 60-inch flat-screen? Roddy, sensing the threat to his lifestyle that a dirty, sloppy sewer rat could pose, decides to get rid of Sid by luring him into the “jacuzzi”, which is in fact the toilet. With the pull of the lever, he could send ol Sid back from once he came. Classless and manner-less Sid may be, but plumbing he understands! He plays along and instead pushes Roddy into the toilet and flushes him away instead. There, Roddy meets Rita Malone (Kate Winslet), and high adventure, narrow escapes, and nautical chases ensue. 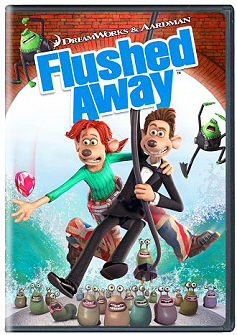 Reviewers who claimed Flushed Away contains a certain British charm have hit the nail right on the head. 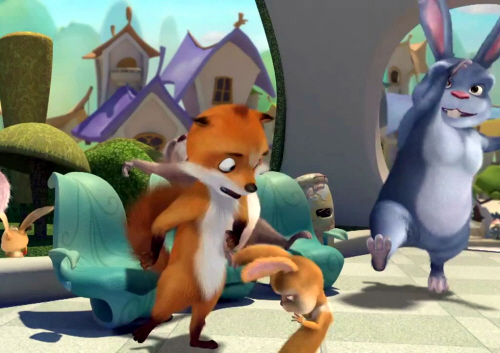 The humor is the odd combination of dry witty dialog (with cultural references galore) and over-the-top slapstick. Theoretically this should be the secret to success in appealing to everyone (little something for the adults to enjoy while the youngsters snicker at the onscreen antics) but unless the viewer is prepared for the type of sublime dry dialog exchanges that happen without warning, much of the humor and charm could go undetected. I was particularly impressed with Aardman’s ability to duplicate the stop-motion clay animation look of their earlier films and series through use of laser scanning and software animating. Many of the textures are remarkably lifelike and, not unlike the dialog, require careful examination to appreciate the layers of depth and pop culture references scattered about. The vocal work is top notch with Hugh Jackman, Kate Winslet and Ian McKellen delivering voice performances no less potent than the live-action deliveries that each is known for. 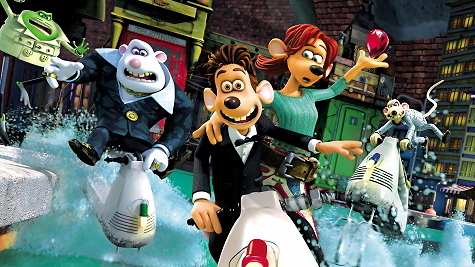 In all Flushed Away comes off as a charming little romp with a bit more underlying depth (no pun intended) than is common in animated feature films. It’s undeniably Aardman though which means it isn’t quite as in your face or over the top as a majority of the DVDs wearing the famous DreamWorks logo.